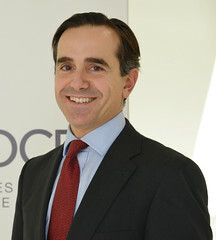 Mr. Juan Yermo took up his functions as Deputy Chief of Staff of the Secretary-General of the OECD on 1st October 2014. Previous to his current position, Mr. Juan Yermo acted a Senior Advisor for the Secretary-General’s Better Policies Series. In that role, he supported the Chief and Deputy Chief of Staff in the planning, conception and content of the “Better Policies Series” designed to provide first-hand and horizontal policy advice for Heads of State and Government and Ministers. He also supported Deputy Secretary-General Danvers in the oversight and co-ordination of the CleanGovBiz initiative. Mr. Yermo joined the OECD in July 1999. He was initially in charge of the private pensions unit and oversaw the Working Party on Private Pensions. He also led the launch of the OECD Pensions Outlook, among other publications. Before joining the Office of the Secretary-General, Mr. Yermo was Deputy Head of the Financial Affairs Division of the Directorate for Financial and Enterprise Affairs and supported the organization’s input to the G20 project on investment financing, including the development of the G20-OECD High-level Principles of Long-term Investment Financing by Institutional Investors. Prior to joining the OECD, Mr. Yermo was a consultant in the Latin America and Caribbean Department of the World Bank and a Risk Analyst for Bankers Trust. Mr. Yermo, a Spanish national, holds a Ph.D. (DPhil) and MPhil in Economics from Oxford University and an MA in Economics from Cambridge University.